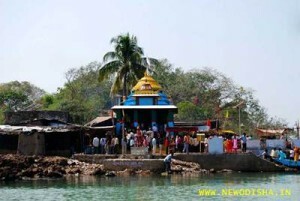 Kalijai Temple is located on an island in Chilika Lake. It is considered to be the abode of the Goddess Kalijai. Highly revered by the local populace, the deity has been venerated in the local folklores and legends. The island provides an excellent destination for pilgrims as well as tourists. Every year in January, a huge gala fair is held during the festival of Makar Sankranti. A girl was newly married and was going to her husband in a boat.As her in-law’s house was inside an island in Chilika Lake it took a lot of time to reach.Orissa coast is much prone to Cyclones and suddenly such a cyclone came and the boat drowned inside the lake.All the Boatmen with her father were alive except that Girl Jaai undiscovered.After the accidental death of that newly wed girl whose name was Jaai she became goddess of people residing nearby area.And till now she is worshiped as an Amsa of Kali,hence the name of the place. Give Responses for "Kalijai Temple of Odisha"